Oświęcim is a Polish town. Its name was changed to Auschwitz in 1939. When in September of 1939 Poland was attacked from two sides and failed to defend itself, the land was cut into two – the western part was incorporated into the Third Reich and the eastern part into the Soviet Union. Oświęcim went into the hands of the Third Rich, and as soon as the Nazis began the occupation, they started to build a concentration camp. The Auschwitz camp was built in 1940, Birkenau was established in a village three kilometres away in 1941, and Monowitz – a German IG Farbenindustrie synthetic rubber factory – in 1942. 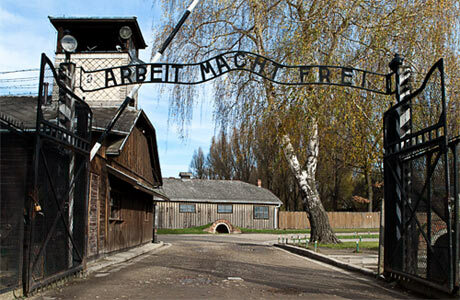 Today it is a state Museum and two former camps, Auschwitz and Birkenau, are open for visitors. In 1947 the Polish government, as motioned by former prisoners of the camp, decided to take Auschwitz I and II into its care, and by the power of legislation transform it into Auschwitz-Birkenau State Museum. For this purpose some of the camp’s infrastructure was rebuilt. In 1979 on the camp’s premises, in presence of 500 000 people, a mass was conducted by Pope John Paul II. During the mass the Pope announced Edith Stein, who was murdered in the camp in bunker no.2. will be beatified. The grounds of the former camp were included into the UNESCO World Heritage List in 1979. The UNESCO committee decided at the time that Auschwitz-Birkenau will be the only place of such sort on the list as a representation of other places of genocide in the world. An uncommon criterion was applied then (cultural criterion VI) which indicates on a timeless and universal meaning of the place. Auschwitz Museum is open every day except for Christmas Day, Easter Sunday and New Year’s Day. Visiting is free of charge before 10 am and after 3 pm. During winter season it is free for all day. In any case our driver will help you in purchasing the tickets. Bear in mind that it is not allowed to carry in handbags and other items of luggage larger than A4 format. Cameras and bottled water are allowed. Journey from Krakow to Auschwitz State Museum takes 1,5h drive. The best way to get to Auschwitz camp is by hiring a private car with a driver. I would like to recommend our transportation service, You can find our offer at www.krakowauschwitz.com, we would invite you to check us at Trip Advisor.